REQUIRED WAITING TIME: The custom engraved text on your badge, and leather clip, requires approximately 6 to 10 weeks delivery. * 100% HANDMADE LEATHER PROFESSIONAL LAW ENFORCEMENT-TYPE BELT CLIP. 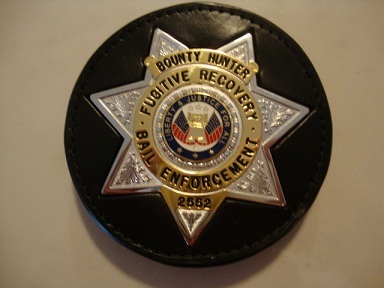 Your badge is made of rhodium SILVER with rhodium GOLD RIBBON INLAIDS and is a custom-made BOUNTY HUNTER (Fugitive Recovery Bail Enforcement)	badge which contains an individual 4 to 5-digit engraved badge number. In the event it is lost or stolen, IPIU (The International Private Investigators Union) will provide you with details to file the lost/stolen registered badge report with federal, state, and local law enforcement agencies. Because this product is a restricted sale item, the shipment is monitored by the IPIU Security Department when purchased. You agree to only use the item within all local and federal laws.